Earlier this week, I touched on a few players’ spring training performances that have me optimistic. Maybe taking meaning from their camp statistics will make me look dumb over the next few months. Probably, in fact. Today, let’s actually follow conventional wisdom: Grapefruit League numbers are meaningless. Our expectations of the following players shouldn’t be altered because of what they’ve done down in Florida. When Luis Severino and CC Sabathia went down, it seemed inevitable that Luis Cessa would nab a spot in the rotation. He was nothing short of fantastic this spring. Yet, after he posted a microscopic 0.98 ERA in a hair more than 18 innings, the righty was relegated to the bullpen. He probably will get a handful of starts this season anyway, but the fact that his performance didn’t earn him a chance every fifth day speaks volumes. It’s nice that he pitched well, but that doesn’t erase his lifetime 4.71 ERA and 5.03 FIP. He’s seen his fair share of major league time over the last few seasons, and now that he’ll be 27 next month, it doesn’t look like he has any upside. Been there, done that. It’s time for Domingo German and Jonathan Loaisiga prove their worth. Or, go to Gio Gonzalez as an experienced veteran. The Yankees re-signed J.A. Happ to solidify the rotation, and just over 11 poor Grapefruit League frames shouldn’t cause much concern. The southpaw was prone to the long ball in camp and surrendered six dingers, which ballooned his ERA to 7.94. His regular season ERA will probably be half that. ZiPS, PECOTA, and Steamer all have him right around 4.00. There are legitimate reasons to worry about Happ, though. Pitchers in their mid-to-late thirties decline, and the 36 year-old Happ is no exception. He’s going to get worse while under contract with the Yankees barring a Sabathia-like resurgence. That being said, cherry picking his spring performance does not make him toast. After he posted an .845 OPS this spring, Wade’s frustration about not making the team is understandable. He had a spot on the 25-man roster until the Yankees made a trade in the 11th hour for Mike Tauchman. Clearly, the Yankees are looking for a bench that isn’t full of light hitters. Pairing Wade with Austin Romine makes for a pretty weak bench, and even though Tauchman hasn’t hit much in the big leagues yet, he’s the type of player the Yankees covet. Wade has a disappointing major league track record. He’s posted a 23 wRC+ in 133 big league plate appearances, which doesn’t cut it no matter how much versatility he offers. No amount of production in spring training can erase that. With DJ LeMahieu and Gleyber Torres having the ability to cover multiple infield positions and Tauchman able to span all three outfield spots, Wade became the odd man out despite his best effort. A .394/.450/.697 triple-lash will open anyone’s eyes in spring training. That was what Gardner did, but we’ve seen this before. He’s a notorious hot starter who wears down in the second half. He has a career 112/89 wRC+ split between the two halves of the season. I’d undoubtedly sign up for a torrid start again this year, especially with the array of injuries the team is dealing with. But, it wouldn’t surprise me if he can’t do it again. At some point, his second half swoons are going to carry over into the start following season, and 2019 could be that year. He authored a putrid 66 wRC+ to close last season and lost his job to Andrew McCutchen, to boot. Clint Frazer is gunning for his role this year. It would be fun to see Gardner have one last gasp, but I’m not changing my opinion based on what he did over the last month. I was basically ready to move on in the offseason. Now, the Yankees have no choice but to start him. The players mentioned above are the ones I found most compelling to discuss. There are other standouts and poor performers whose results mean next to nothing, but it’s not worth a couple of paragraphs. No, I’m not worried about Gary Sanchez, DJ LeMahieu, or Adam Ottavino. I don’t think Nestor Cortes, David Hale, or Gio Urshela are hidden gems. I think that’s a little too obvious. Spring Training is over, folks. The Yankees wrap up their exhibition schedule tonight at Nationals Park, so, for the first time this year, they’re going to play in a big league ballpark. That is pretty cool. After tonight’s game the Yankees will enjoy off-days Tuesday and Wednesday, then open the 2019 regular season against the Orioles on Thursday. Hooray for that. Available Position Players: C Francisco Diaz, C Austin Romine, 1B Greg Bird, IF Angel Aguilar, IF Thairo Estrada, IF Kyle Holder, OF Trey Amburgey, OF Jeff Hendrix, OF Mike Tauchman, OF Zack Zehner, UTIL Tyler Wade. Aguilar, Estrada, Holder, Amburgey, Hendrix, Zehner, and Wade are the lucky minor league camp guys who got to make the trip. Available Pitchers: LHP Zack Britton, LHP Nestor Cortes, RHP Cale Coshow, RHP Joe Harvey, RHP Tommy Kahnle, LHP Trevor Lane, RHP Adam Ottavino, RHP David Sosebee, RHP Greg Weissert. Cortes, Coshow, Harvey, Lane, Sosebee, and Weissert escaped minor league camp to make the trip. Like I said, there is rain in the forecast in Washington this evening. The internet tells me it’ll start raining around 6pm ET or so, with the heaviest stuff set to arrive about an hour later. Once the rain starts, it’s not supposed to stop until early tomorrow morning, so don’t bet on a mid-game delay. They’ll call it after a few innings. Anyway, first pitch is scheduled for 5:05pm ET and you can watch live on MLB.tv and MLB Network. (MLB.tv is free tonight. Just sign up for a free MLB.com account.) MLB Network will show the game in the Yankees’ home market and there are no MLB.tv blackouts in Spring Training. Enjoy the game. ?Your browser does not support iframes. The Yankees closed out their Grapefruit League season with a win this afternoon. The win clinched the best record in Spring Training. The Red Sox had the best record in Spring Training last year and they went on to win the World Series, so start planning the parade. Anyway, Clint Frazier’s bases-clearing double was the big hit today. Greg Bird went hitless in his first game action since taking a pitch to the elbow Wednesday. The Grapefruit League finale has arrived. The Yankees close out the Florida portion of their exhibition schedule against the Twins today. Following today’s game the Yankees will travel up to Washington for tomorrow’s exhibition game at Nationals Park, then it’s back to New York for the start of the regular season. Hooray for that. The full lineup card didn’t make its way to Twitter this morning, so I’m not sure who is available off the bench or out of the bullpen. Safe to assume all the reserves are minor leaguers and non-roster guys. The regulars hung back in Tampa. It is nice and sunny in Fort Myers today, so the Yankees are closing out the Grapefruit League portion of their spring schedule with some great weather. 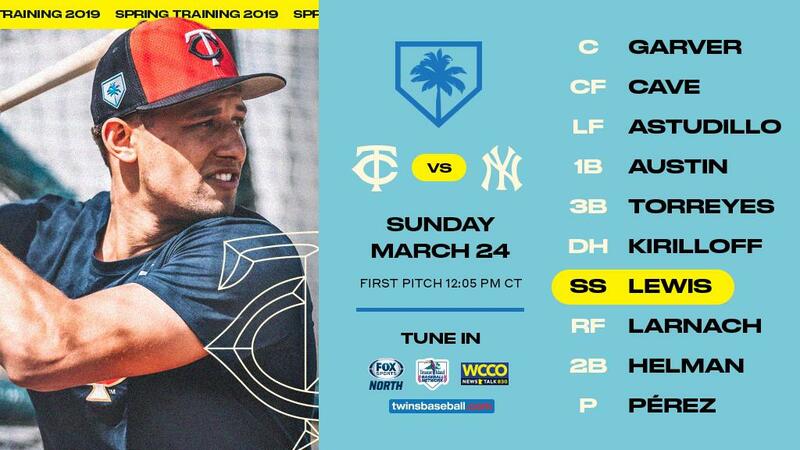 This afternoon’s game will begin at 1:05pm ET and you can watch live on MLB.tv anywhere and on FOX Sports North in the Twins’ home market. There is no YES Network broadcast today. Enjoy the game.